If you’re staring at a clock, chances are you’re waiting for something miserable to be over or something fantastic to begin. With the Butterflies Pop Out Clock, I suppose time will begin to fly, or at least flutter, on by. The sleek and modern wall clock has clean lines, a black matte surface, and sans serif numerals. But then things get crazy when elements of the clock break away to take on a life of their own. 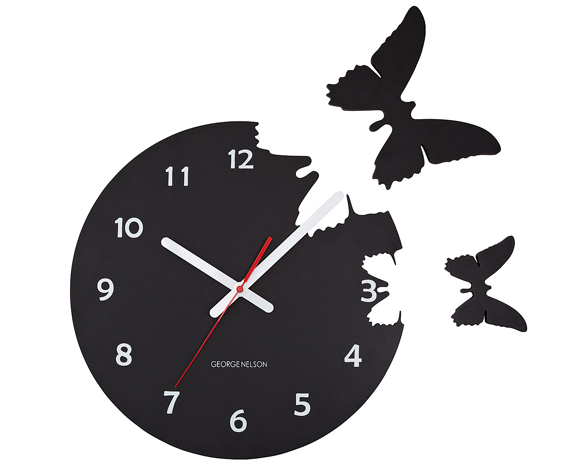 Those pieces transform into butterflies that leave behind butterfly-shaped openings in the clock face behind them. The butterflies are easily attached to any wall surface using an adhesive backing.